Katherine Hepburn – Available for Adoption! 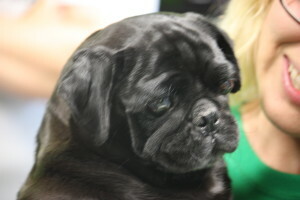 Katherine Hepburn is a sweet 6 year old black pug who is really embracing the pug life. Even though her vision is a little impaired, she has no problem getting around and is eager to explore when she feels comfortable. She loves being with people and cuddles on the couch may possibly be her favorite thing in the world. We’re still working on housetraining but she’s doing great! She usually goes when we take her out and only has a few accidents but that will probably become less of a problem as she learns she can tell us she needs to go by going to the door. Katherine is still not completely sure about the leash/harness but she doesn’t seem to particularly dislike them either. She has been great with all her foster siblings (dogs and cats) but she isn’t afraid to tell another dog if they’re being too familiar. She’s very clever, she’s already mostly figured out stairs (just going down that last set is left) and how to get back inside using the dog door. 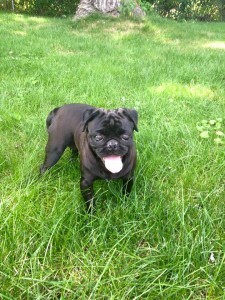 She’ll make a wonderful companion for anyone who loves cuddles and pug kisses. Interested in adopting Katherine Hepburn? 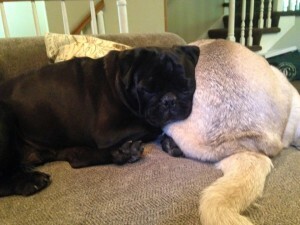 Please fill out an application at: www.pugpartners.com/adoption-application. Katherine Hepburn’s minimum adoption donation is $325.